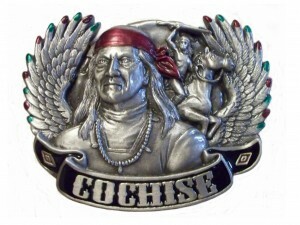 Depicted on this high quality zinc and pewter buckle is Cochise, one of the most famous Apache leaders. Cochise County, Arizona is named after him. The buckle is hand finished in red, green and black enamel.